This is a tough one to write about. I mean, I've wanted to play it for ages, and I love Star Wars. And the fact I didn't like it doesn't mean it's a bad game. In fact, given more time, I could probably really get into it. But I only gave it an hour, and to be honest, it hadn't really got started in that time. The game is set way, way before the Star Wars movies. It starts in familiar fashion... the music, the scrolling intro, the pan down from space to a spaceship under attack. And then to your dope of a character, rolling out of bed as the unpteenth laser blast finally awakens them from their slumber. Thank goodness for that, the guests have started to arrive! 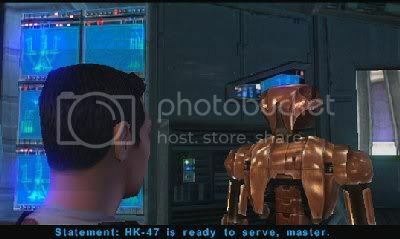 Knights of the Old Republic is pretty dialogue-heavy... it is more of a role-playing game than an action game, after all. The problem for me is that, at least to start with, there's no flow to the game. Instead of having a tutorial, you learn as you go, with another character joining up with you and explaining how to use your inventory, maps etc. You'd think this would be the best way to go, but as soon as you encounter anything in your travels, the game stops while he tells you how to go about your business.